Let’s go international for this Totally Pretentious Food Truck Review! Actually, Puerto Rico isn’t international, but whatever. 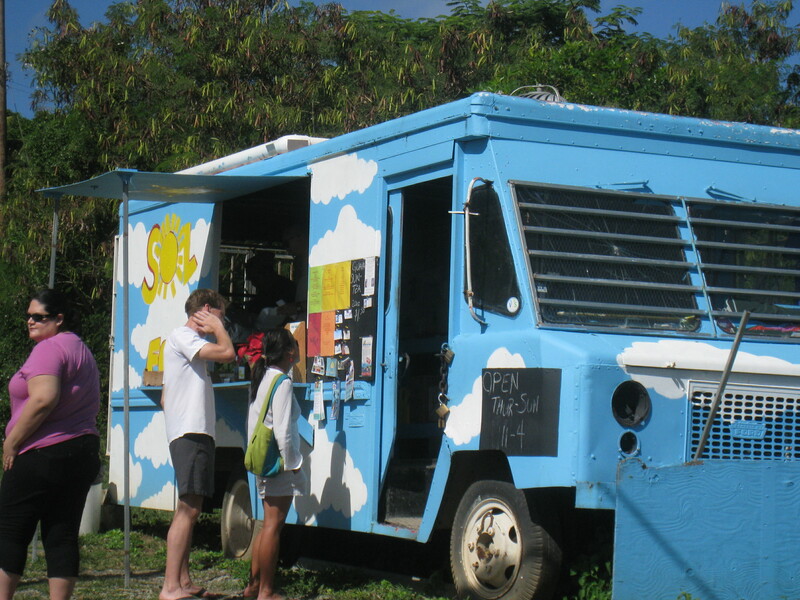 It was tropical, and so was the food at Sol Food in Vieques. 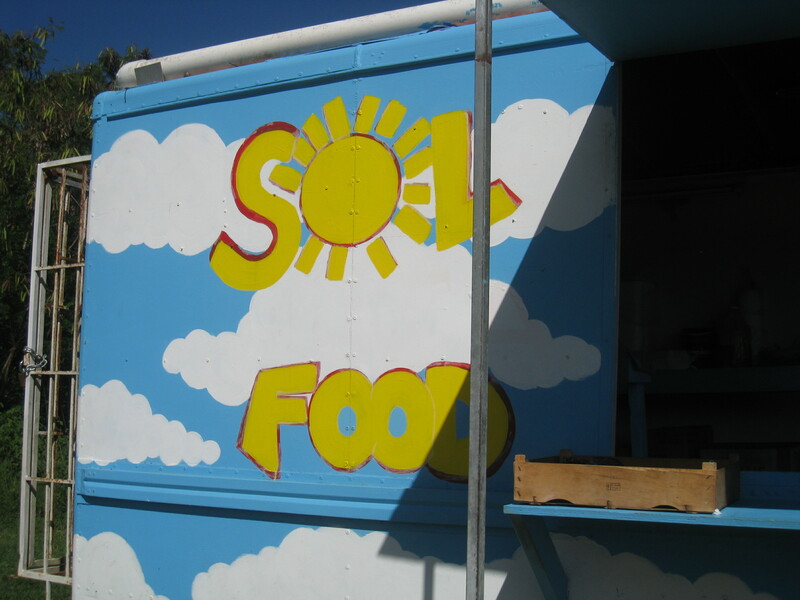 Sol Food is on the corner of a busy intersection on the road to the National Wildlife Refuge. Now in its third season, Sol Food is open Thursday through Sunday, from 11 am to 4 pm. Nice hours if you can get them. We went on a Thursday at around 1 pm. For this food truck meal, I had a very special guest, fellow food critic and lover of all things pork, XFE humored me by ordering a few things for scientific and journalistic purposes. The menu was quite varied and reflected the aesthetic of the island. There were sandwiches, wraps, vegetarian dishes, empanadas, as well as baked goods in the form of brownies and gingerbread. XFE, of course, ordered the pork carnitas ($6), which came two to an order and included tomato, lettuce and a sour cream sauce. 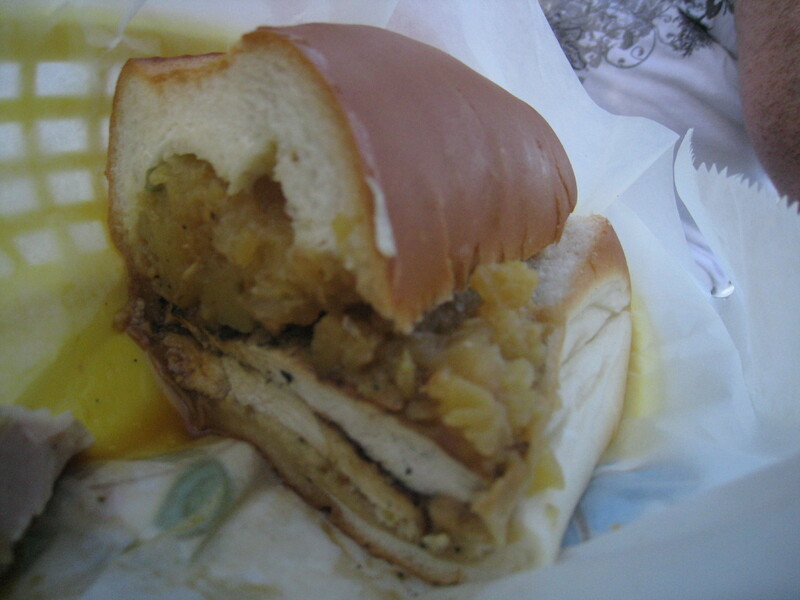 I ordered the Bob Marley ($9), a jerk chicken sandwich with pineapple chutney. We also ordered a ham and cheese empanada ($3) to share. 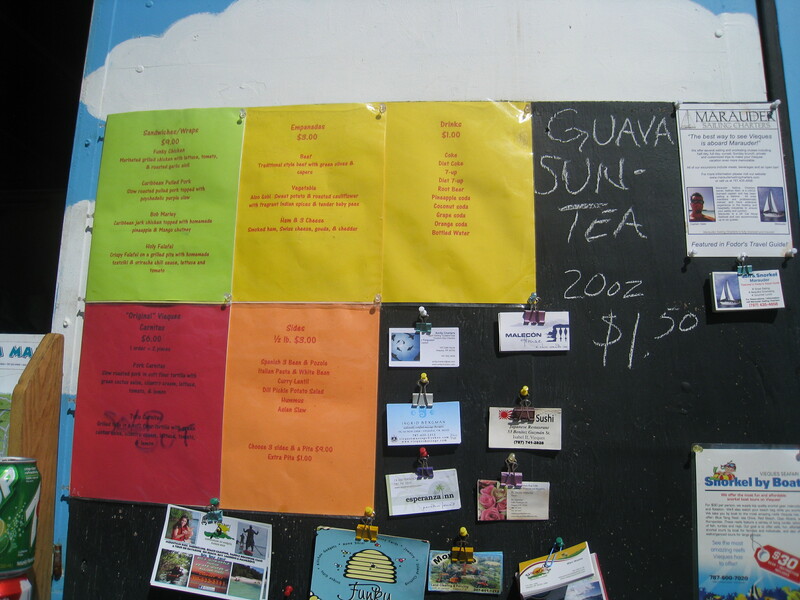 I ordered a guava sun tea ($1.50). They also had a huge selection of exotic sounding and colorfully labeled island sodas, including a coconut soda, but despite my pleas, XFE ordered only water. Unlike previous TPFTRs, I did not rush back to my cubicle to partake of this island feast. Instead, XFE and I retired to the area behind the truck, which was replete with white plastic patio furniture. While we waited for our feast, we were regaled by the sound of barking dogs and crowing roosters. Finally, after about a five minute wait, our food arrived. 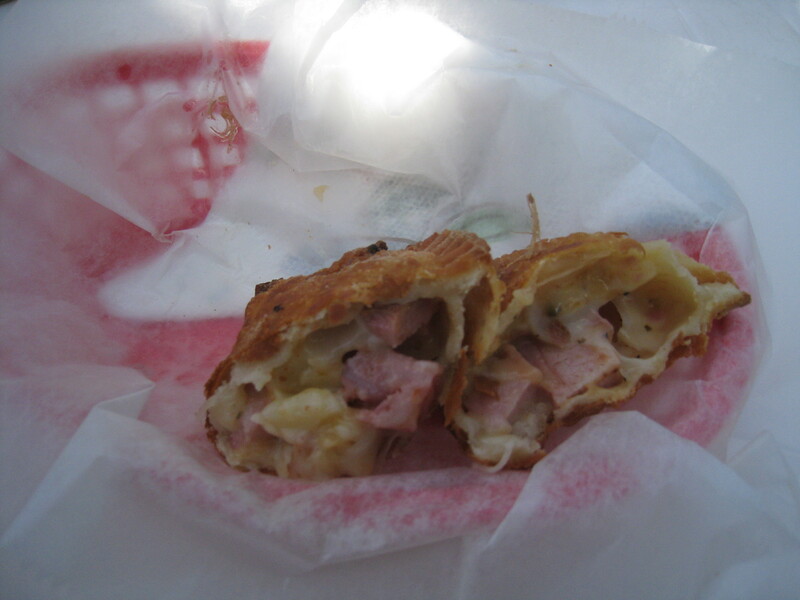 The empanada was gorgeous, fried to a dark golden crust, with huge chunks of ham and gooey cheese inside. A few dashes of Wiley’s Essence of Chernobyl hot sauce (named after the proprietors’ Siberian Husky) was the perfect vinegary complement. It was a great start. XFE’s carnitas were delicious and generous. The hearty flour tortillas strained under the juices of the smoky meat, but held impressively strong. The chicken in my Bob Marley was tender and juicy, but my bread had a bit harder time holding up to the juices. And, there wasn’t enough jerk spice to stand up to the sweetness of the pineapple chutney. I liked it, but I would willingly try something else next time. It was a solid lunch. $20 is not bad for two people, including drinks. 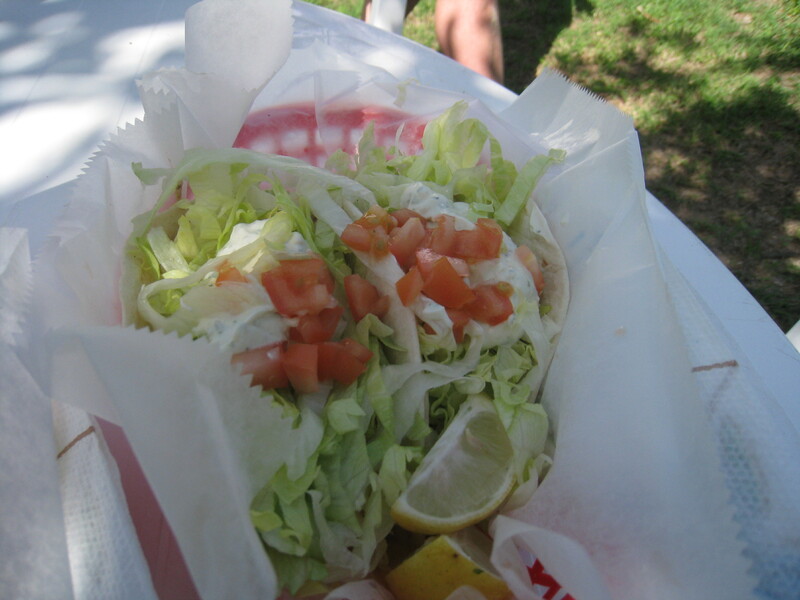 They had friendly service, good flavors and selection, and a convenient location with plenty of parking and seating. I’d give Sol Food a strong two out of four wheels.